Looking for a paint that is safe and environmentally friendly? Consider using Old-Fashioned Milk Paint - a paint that is lead free, has no chemical preservatives or fungicides. This paint is safe for children's toys, furniture, any project in your home. 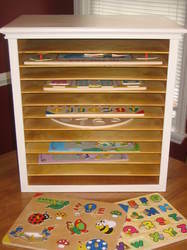 The puzzle organizer at right is finished with white Milk Paint. We have all colors in stock, but contact us to make sure we have the quantity you need. Johan has been using Old-Fashioned Milk Paint for over 10 years. The finish is durable and produces deep, rich color. Consider attending a Milk Paint class to learn more about how to use this environmentally friendly product.